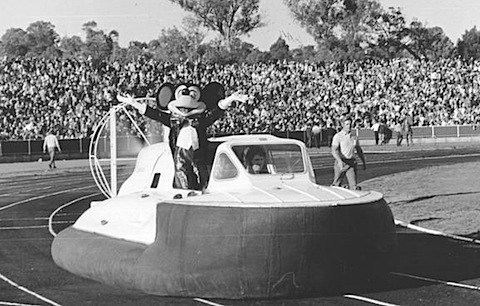 I hired a noisy hovercraft for Mickey Mouse to arrive into a filled to capacity Perry Lakes stadium to celebrate his birthday. The first time a Disney on Parade arena show that had been produced outside America was done by Channel 7 Perth. It was the brainchild of Brian Treasure. He had succeeded in convincing the Disney organization that we at Channel 7 could produce and mount, with their cooperation and expertise a Disney on Parade arena show which would tour Australia. Michael Edgley, the Bullen Brothers the Circus people and many other smaller investors joined in to finance the project too. Naturally there were a lot of Americans involved, the head of each department designing, costuming, choreography, stage direction and presentation were all done by Americans. However many Australians, and many Western Australians would join the production in key roles. Many Australian and local dancers and cast members would join the principal American cast for the show. Some of especially acts would come from America complete. 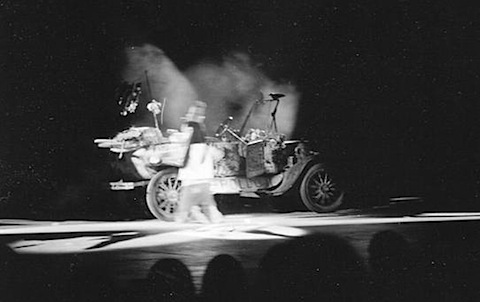 For example Goofy’s comedy car and old ramshackle T Ford which, amongst other humorous antics, driverless, chaste Goofy around the stage. Goofy’s Comedy Car on the Disney on Parade stage in the TVW big tent. But most of the costumes were made and sewn by local seamstresses, under their direction of course. And a great number of props and parts of the sentence scenery were made here too. All the music was played and recorded inAmerica, as were all the film introductions of the Disney stories that were used to start each of the separate parts of the program. The complete soundtracks were recorded in USA and assembled in a large purpose-built audio control room which was full of multi-track playback machines. This control room was virtually a giant sea container which could be quickly packed up for touring. 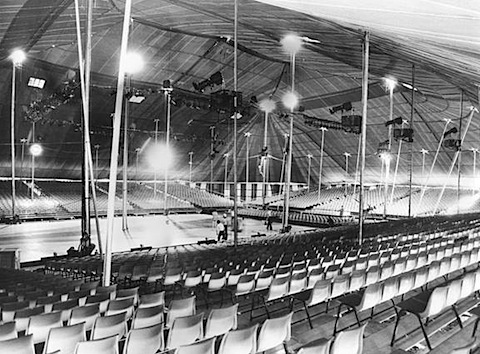 All the lighting was hired in Australia, but some of the grid work which hung inside the big tent was imported from USA, because mainly it contained flying cables for aerialist acts, and some special lighting and visual effects. The whole Disney on Parade arena show was housed in a giant tent owned by the Bullen Brothers the Circus people, which I think seated, some 5000 people around a huge thrust stage. Later Channel 7 purchased an even bigger tent which had been used in South Africa. It was even bigger and could accommodate 10,000. This was used for the Peter Pan shows. It was quite an achievement for us at Channel 7 too to pull off such a contract, and quite a feather in Brian Treasure’s hat for convincing Disney’s American producers to mount and stage the show for Australia in Perth. And quite a feather in the cap and showed the forward thinking of the Channel 7 Board for agreeing to join the project. I would think the Board and the other investors also had one eye on the bottom line. The other important feature was perhaps, the employment of large cast Western Australian dancers, actors and staging personnel, who would have employment for a least the next 12 months of the tour. We would all gain heaps of experience. It was going to be a great show, and a great achievement. It would set the stage for other Disney programs, and for the Hannah Barbara organization to also mount arena shows, produced in Perth for Australia and Asian tours. Mickey and Minnie Mouse, Snow White, Cinderella, Alice in Wonderland and the story of Jungle book were all featured in the first Disney on Parade. And in later shows of Fred Flintstone and Barney Rubble from theFlintstones, Yogi Bear. They were at the peak of their popularity. Because Brian Treasure was such a dominant and forceful character everyone was a bit fearful of him, especially when they were called to into his office. When called in on this occasion my first thought was, what have I done wrong this time, flashed through my mind? As I entered his office he had the visitor with him, it was Mike Grilikies the American producer here to make a TV special of the Disney on Parade arena show for the American network. With a handshake we were introduced. BT as we called him, not to his face, continued saying. “We need a Unit Manager for the American TV special. …and that’s you!” He said. After a little more in the job description department, Brian handed me a bunch of cards. They were applications to join the Theatrical Employees Union for all the staff that were about to transfer and work on the TV special. As he explained some of the people weren’t keen about joining the union but many more were insisting on it. So I was to keep it quiet, fill out forms for all our people and forward them on with a joining fee to the union office, quietly. With the door closing behind me, I stood there for a second, probably with my mouth open, with Treasure’s secretary quizzically looking at me. Now back to my office I realize that I had suddenly much more to do. Much of the local live TV production had been much reduced because of our work with Disney. A lot of our TV props workshop was taken up with building scenery every available space seemed to have people working in. In fact we had hired a prop building workshop in Osborne Park were all the small props were being made. Many seamstresses were working in strength too with their sewing machines whirring madly in any available spots. Costuming dummies were everywhere, with the hundreds of costumes already sewn, covered with plastic awaiting fittings. The whole place was in a real buzz. Now, on top of everything else we were doing, including the advanced unit doing shows at shopping centers, we were to now make a TV special! That meant more props more scenery, especially for the TV show. More staffwere arriving from America connected with the TV program. A specialist TV group was also coming from TCN Channel 9 Sydney. They were to bring a specialist film recording unit to be used to film for the production. This later proved to be of no value, mainly because the light level on the thrust stage was too low, and extra lighting in the tent would inpractable and too disruptive. The colour television system incorporating what was now very new to us, would be used. Colour television cameras were adapted and the TV show would be recorded using the American colour NTSC system. Dual recorded videotapes would also be recorded in both the American standard and the Australian 625 line PAL system, and an edited version of the program would be made for Australia. The experiment on which the decision was to be made, whether to use film or videotape was in part due to my television camera work, of which I was quite proud. Because so many of our studio crews were being used in other areas and in the every day running of the TV station, I was about the only one left who could manage to operate the special colour TV camera, with its amazing low light level performance, and its special zoom lens. Only the one camera would be used for the test, I think from memory it was the only one in Australia at the time. More cameras would come later for the TV show recording. A platform was constructed just to the side of the thrust stage for me, I was glad that I had seen a number of performances and rehearsals of the show so that I had a pretty good idea of what it looked like and what had to be recorded. This helped me to anticipate the various entrances and exits of the acts. And the positioning on the stage of the various routines and dancers and the lighting effects that made the show such a wonderful success. My earphones were connected to the stage and lighting manager’s cues, and I also had the music and sounds in my earphones too. Disney on Parade Cinderella segment of the show. With the help of video recording technicians, I was able to record the complete program. And, even though it only showed one camera angle, I must say it was complete success, proving that the video recording would be far superior to the costly and more time consuming film unit system from Sydney. The poor Sydney people from TCN were a bit crestfallen when they saw the result of my recording. But they agreed that videotape was best. I got quite a few pats on the back for that effort, it proved again to me, that one of the great loves of my life was, running a live television camera and that I was good at it. Much of my role now as Unit Manager would be with the crews and stage people, although I didn’t have a very good idea of my complete task. But it sure kept Me on my toes. Once quickly finishing my normal tasks at Tuart Hill, I would go down to our office that we had set up at Perry Lakes. It was here that I fixed up any the problems and I also spent much time liaising with the Americans and helping them solve their problems and requests, dealing with local people and suppliers. The Disney producers had chosen Kurt Russell, a new rising star to host the TV special. The American producers had adapted parts of the arena show for the 55-minute TV special. The shows writers had adapted the script and written hosting parts for Russell. He was a pleasant young chap, I think only about 16 years old time. On a couple of occasions I sat with him in the sun outside the tent, occasionally chatting and helping him learning lines, while he waited for his call for next sediment of the TV special being recorded inside. There were quite some interesting and funny episodes dealing with the American producer’s. One such incident showed the great difference in what they thought was the cost of things and the differences between Australian and American dollars. The American Director early one Sunday afternoon during the recording, wanted to change a camera angle to be high above the seating at the back of the stage. He wanted a scissor lift. I found the suppliers and came back to him saying, yes it’s available but it was, what I thought terribly expensive, seeing it was Sunday and on short notice. He said. “How much?” I told him expecting he would reject the idea. Instead he just said. “Man, that’s free.” Meaning that was cheap, it was something like $100 an hour plus travel time. So we hired a unit and its operator for all of Sunday afternoon. He mostly sat near his machine but enjoyed seeing the shows recording too. At one stage the Director wanted a real low angle shot late during one evenings recording, much lower than a small tripod could handle, the lens was to be level with the ground surrounding the stage. We bought in a bobcat and without asking anyone’s permission, dug about a two meters square hole about 1.5 meters deep in the middle of the Perry Lakes Rugby field over which the show tent had been erected. Once the shot was taken we filled it in again and kept our mouths shut about the experience. I hope the shots were worth it. Whether they got into the show I can’t remember. Nobody was very keen to have the Americans driving themselves around in Perth because they drove always started on the wrong side of the road, and got lost so that many of their crew were always driven. Many of the off duty Channel 7 staff and parts of the sales and other department staff gave up time and sometimes holidays to drive the fleet of cars, driving around the Americans, they all had fun doing it. They and their families all got tickets to see the show. An interesting aside was that, when the American producer Mike Grilikies and his Director finished recording the TV program, they both flew back to the States on different aircraft and the second copies of the hundreds of videotapes were also separated into two lots, and sent back on different aircraft, it was said that if one aircraft went down they wouldn’t lose the show! The Bullen Brothers tent crews, augmented with extra hands, were hired for the TV special as stagehands. Some of the shows stage settings had to be taken down for the TV program, and this invariably happened after the show, and after the patron’s had gone home. Late one Saturday night I was instructing the Bullen crew to set up the Cinderella scenery ready for the TV show recordings to be started early Sunday morning. The leading stagehand came to me and said the crew would not start the setup until they had been paid. That really “foxed” me and I found myself knocking on Stafford Bullen’s caravan door at about midnight. The Bullen Brothers, like most of their crew all lived in large caravans on the Perry Lakes site. The door opened, and I told Stafford what the crew had said. He sort of snorted and pushed past me, and quickly walked across to the tent, jumped up onto the stage were all the men had assembled. He bellowed instructions and words to the effect that they would be paid after the set had gone in and not before! After the tongue lashing the men look crestfallen, because it was not a good idea to challenge their boss, and they got quickly to work. There was something about circus people. About an hour in half later, when all was finished and the setting was in place, Stafford appeared with the huge role of notes in his hand, and proceeded to peel of them are off one by one and give them to the men. He turned to me and said, “If we’d pay ‘em before, we would have had problem, they’d have gone off and got drunk.” He turned and went back to his caravan and to bed, leaving me standing there with my mouth open. It was quite an experience working as Unit Manager on the TV program. Not all experiences with the TV show recording were bad. There were many fond memories, and it was a great show, nothing like it had been seen for done in Australia before and yet we were doing it from Western Australia, here at Channel 7. The staging and dancing was colourful and spectacular, and of course the Disney tunes were memorable. The Dumbo Circus segments and the staging were well done. Snow White and the House of Cards dancing and costumes were very special. And the Cinderella segment was great entertainment. 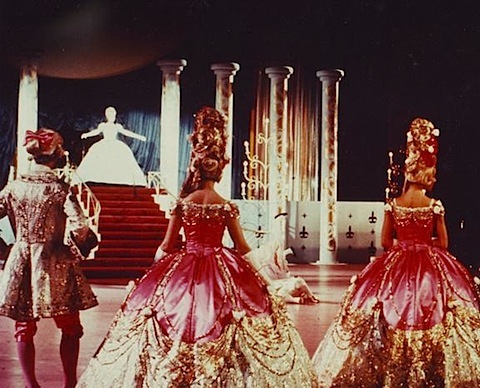 The sequences with the humorous segment of Cinderella’s Ugly Stepsisters bought the house down. The whole show was a real winner. The television set for the TV special of the Cinderella segment of the show inside the big tent at Perry Lakes rugby field. I nearly forgot Mickey Mouse Birthday. It was decided to hold a giant birthday party in the main stadium of the Perry Lakes Stadium itself in which all the Disney characters arrived and had a party, including the of course you know who would cut a giant birthday cake and they would be much singing and dancing. The show was a great success, over 40,000 people turned up to celebrate and join in the fun. It was great publicity for the show too, because from the stadium you could look across to the rugby field and see the giant tent ready to stage the actual show, which incidentally was lit at night in spectacular fashion. In my thoughts about the experience, it was sad that it was finished and the Americans had all gone home. But I was glad in another respect that MY workload was greatly reduced, and we got back to our core business television, and to our new special events department. It did however give me a greater insight into the expectation of what we would be involved in the future when Channel 7 took on the construction of the Perth Entertainment Centre on the old railway land along Wellington Street to be opened in 1975. That opened in spectacular fashion with the second Disney program featuring Peter Pan. I was Catering Manager at TVW 7 at the time of Disney on Parade. My job along with my staff was to cater for a half time crowd of around 5,000 for munchies and drinks then after the show, more of the same if I remember rightly. This was in a Circus Marquee set up at Perry Lakes. The show stopper for me though was the humungeous buffet I was commissioned to do. I did a Telethon but this was by far more involved. I was given the task of re creating Sardi’s Restaurant in New York and apart from anything I was entrusted with many caricatures of the various stars of screen and stage.I had to have red and white tablecloths made which were in a small check pattern. I created a bar set up in the room under the stadium complete with Antique sideboards supplied by my father in laws antique shop in Como. I decked out the Barmen in handlebar moustaches with vests and garter on the sleeve. I had the Giant from the cast and the “little person” as doormen meeting all guests and escorting them to their tables. My budget for the buffet was $25,000 which was a huge amount at that time considering I was being paid $59/week. Ken Kemp (Kempy) was my constant contact for expenditure and provision of props etc from his area. Needless to say I was well monitored and had to justify every idea, the only time I escaped his scrutiny was when I talked food (much of the strange stuff came from the “Re Store”, not heard of yet in Australia). 250 were booked however with various people bring along a late guest close to 400 squeezed in. The site of the 7ft 2″ with the 3’6″ foormen taking people to their seats was pretty unreal. After formalities, the Giant footman grabbed a jug of beer which was to him a glass and I found him passed out early in the morning hidden by the tablecloth drapes with a couple of young ladies. I have many stories as this was a very vibrant time in the stations history. 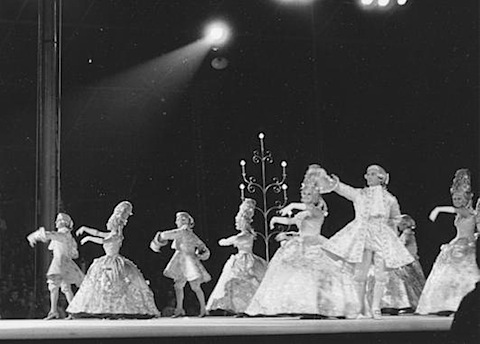 I was thrilled to find this site as I played the part of Mini Mouse in the above production (although I left the company at the end of the season at Sydney) and was one of the dancers (in the photo above) I was Sarah Fidirikkos at the time, an English dancer who had arrived in Australia in 1970. I remember the film being made and because I left Australia in 1972 I never had the chance to see it. Is there any way I could see it now? I now live in Tiverton, Devon, England with my husband. I have a few memories of the dramatic tour and would be happy to forward any if you would like some. I was Eleven years old, when Disney on Parade came to South Australia. I will never forget it as Long as I live. I collected hundreds of beer bottles to cash in, to by myself a Ticket. I was Spellbounded by the Large Headed Characters especially the three litle pigs and the white rabbit. Is there anyone who has or know’s of the color version of the Alice show that was taped in Australia in 1971? Is there any way we could obtain a copy of this recorded show? Sarah Bennett-Green & John Mearns – perhaps if you see this – you might wish to contact John for further information – we would like to have as many as possible attending. Is it possible to get a copy of this video? Or even, would you upload it to youtube? My mother was a dancer in it and I would absolutely love to see her perform. Just wondering if it is possible to get a copy of the footage? i was 2 years old when i saw disney on parade and i can still remember the thrill of getting to shake mickey mouses hand. My parents took me to see Disney on Parade. Before the show began a man approached my father and asked if his son [me] would sit on Kurt Russell’s knee during intermission while a TV commercial was filmed for the special that was being produced for American TV. I was about 10 at the time and I think Kurt prob about 17 or 18 and he smelt good. I sat on his knee smiled at the camera and waved at the camera and the imagined US TV audience. When I have recounted this story, people have thought me bonkers. It was great to find this site. If anyone knows how to source the special or ad I would love to know. I played Alice in Wonderland in the Australian production of Disney on Parade in the 1970’s, and was in the television production which appeared on American television. I enjoyed playing the role very much, and have fond memories of the cast and crew. I live in Perth, Western Australia with my husband Joe Romanoski (from Chicago, USA). We still continue our dancing. Michelle Randell, I have been to this page before, hoping to see some mention of you. My mum was administrator of the WA Ballet co. while you were there and, if memory serves me correctly, I believe we both competed in the Miss West Aust. contest at the same time. Here is a video of one of the American Tours.